Thoughts of a medallion-style holiday quilt were in Karen's head long before she sat down to plan the design on paper for this quilt. She first drew the poinsettias on each quadrant and then added other holiday motifs until she had a composition she liked. Karen's elaborate, hand appliqued and machine quilted tribute to the season was completed in eight months. 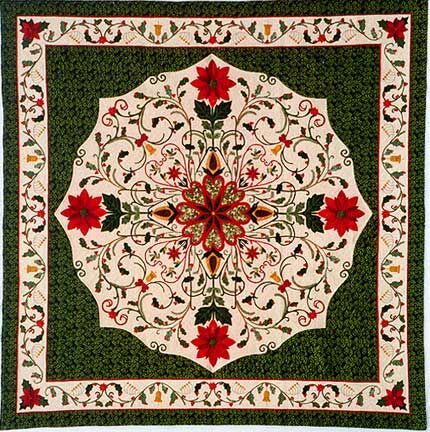 Memories of the Holidays won best of show at the Quilters' Heritage Celebration in April 2000, and first place, traditional, at this year's Pennsylvania National Quilt Extravaganza. Memories of the Holidays appeared on the December 2000 cover of Quilter's Newsletter Magazine.